The arrests of two people in connection with a Twitter hoax in Mexico has sparked another clash over free speech online. Analyst: People once yelled "fire" in theaters; "now the whole world is like the crowded theater"
(CNN) -- One Mexican state's tough stance on Twitter posts could have a chilling effect on social media throughout the country, analysts say. 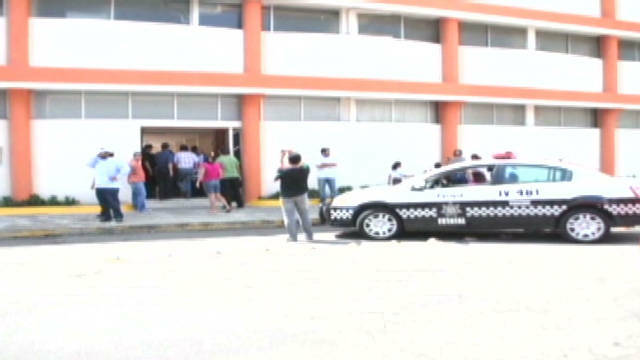 After false rumors about school attacks spread on Twitter and Facebook and caused real-life chaos on the streets of the city of Veracruz, state prosecutors accused two people of terrorism and sabotage for their posts. The charges could put the suspects behind bars for up to 30 years. The pair's attorney is asking a federal judge to block the state's case, arguing that local authorities are abusing their power and violating free speech rights. Some free-speech advocates and fellow social media users have criticized the government's reaction, arguing that the possible punishment does not fit the crime. Officials have defended their approach, saying the suspects should be punished after irresponsible actions online sparked widespread fear in the port city. "Social networks are an excellent way to communicate, but sadly there are cowardly people who hide behind them only to hurt," Veracruz Gov. Javier Duarte said in a Twitter post after announcing intentions to pursue terrorism charges against the suspects last month. The August 25 posts spread rapidly on Twitter and Facebook. One claimed that five children were kidnapped. One mentioned bomb threats. Another described a helicopter firing gunshots at an elementary school. Parents panicked, rushing to rescue their children from schools they feared were under attack. Traffic jammed and cars crashed. Gerardo Buganza, interior minister in Veracruz state, said the accused confessed that they sent messages "to generate terror, which they ultimately did." But several experts say the state government's harsh response could stifle social media, an increasingly common way to communicate about violence in Mexico at a time when some don't trust reports they're getting from the government or more traditional sources. "It is absolutely disproportionate to say that a Twitter post can be an act of terrorism," said Raul Trejo Delarbre, a professor who studies social media at the National Autonomous University of Mexico. The case caught the attention of Amnesty International, which released a statement calling on Mexican courts to respect the rights of the accused "to a fair trial and to freedom of expression." Last month, a group of about 20 young people protested in front of Veracruz state's Congress, demanding that government officials set the suspects free. "They cannot compare virtual terms with real ones," group spokesman Roberto Arucha said. But such cases are complicated, said Ryan Calo, a researcher at the Stanford Center for Internet and Society. "I think that it is appropriate to mete out some punishment for this behavior. ... If it's a clear-cut case where there was actual harm, then I could see why the government would act," he said. "But they can't go overboard and they can't paint with too broad a brush, precisely because it will compromise a free-speech environment." Internet use in Mexico has climbed in recent years, Trejo said. So has violence, amid Mexican President Felipe Calderon's crackdown on cartels and criminal organizations' wide-reaching disputes over drug-trafficking routes. "They are two phenomena that have grown in a parallel manner," said Trejo. And increasingly, social media like Twitter and Facebook have become a key way for Mexicans to share information about violence. "In the last few years, social networks have played a very important role in generating this type of communication about possible attacks," said Jorge Chabat, a security expert at Mexico's Center for Research and Teaching in Economics. "In some cases, the population does not have many other mechanisms to protect itself against actions of organized crime groups." Hours after panic broke out over the rumored attacks in Veracruz on August 25, a man in the northern city of Monterrey sent rapid-fire Twitter posts reporting details of a torching attack on a casino that left 52 people dead. The Twitter account of the event provided updates before officials and traditional media. "I don't receive a salary for this, but I earn the satisfaction of warning people," said the account's coordinator, a rescue worker who asked to remain anonymous because he feared for his safety. "I hope to save lives. Because this vocation is in my blood." Social media in Mexico plays an important role in an era when many local newspapers facing threats from cartels have scaled back or stopped covering violence, said Andres Monroy-Hernandez, a fellow at Harvard's Berkman Center for Internet and Society. "In some ways, social media's filling that void," he said. Examples of false rumors spreading on social media have popped up in other parts of Mexico, including reports of nonexistent shootouts in the central city of Cuernavaca, Trejo said. In such cases, posters apparently wanted to "distract the police with false reports" or "test the police capacity to respond," he said. Chabat says it's difficult to determine the best way for the government to react to online rumors. Federal authorities should consider creating regulations to deal more specifically with online rumors, and determine an appropriate punishment that is "much less" than 30 years in prison, he said. "These types of rumors are very difficult to pinpoint who is spreading them. They could have thousands of origins. I understand why the government must be worried. They can cause panic," he said. "But sometimes they could be truthful rumors. Society also has a right to protect itself." People on both sides of the controversial case agree on one thing: the incident highlights how quickly -- and widely -- rumors can spread online, and the importance of thinking before you tweet. The micro-blogging site lets its roughly 200 million users push out quick, 140-character blasts of information or, with a single click, share another user's post with their own followers. That's what has made it an essential tool in places like Egypt and Iran, where anti-government demonstrators were able to organize and mobilize using the site. But lies spread on Twitter just as quickly as the truth. "Once people were yelling 'fire' in a crowded theater. Now the whole world is like the crowded theater. ... It's so easy just to sort of shoot out a line on Twitter about something. There's a real lowering of inhibitions," Calo said. Last January, in the wake of the earthquake in Haiti, false rumors flooded the site, claiming that airlines were offering free flights there for doctors and nurses. A fake image that made the rounds earlier this year purported to show a racially offensive sign at a McDonald's restaurant. And celebrities are often falsely reported to be dead on Twitter. Actors Jeff Goldblum and Morgan Freeman, comedian Bill Cosby and rappers Nicki Minaj and Kanye West are just a few of the high-profile people "killed" on the popular site. 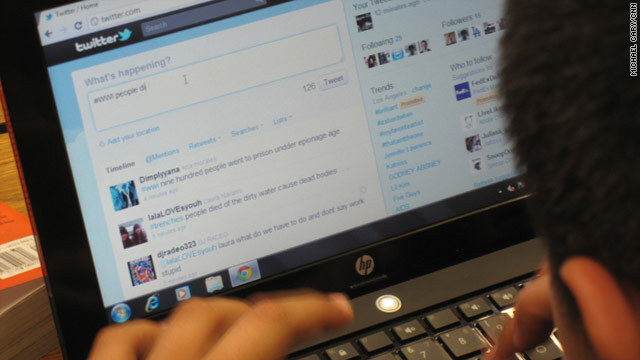 Mexican officials aren't the only authorities who have considered cracking down on social media. Last month, in the wake of riots that rocked London, British Prime Minister David Cameron proposed shutting down access to sites like Facebook and Twitter to people the government considers a threat. After international backlash, his government announced no such law would be pursued. But at least two men, a 23-year-old and a 20-year-old from northwest London, have been jailed for Facebook posts that the government said incited violence during the riots. Neither of their posts resulted in actual violence, police said. In Mexico, analysts say the Veracruz case may be among the first of its kind, but it likely won't be the last. "In an environment of fear, certainly these types of rumors find fertile ground to grow," Chabat said. "It is truly difficult. Surely we are going to see these types of situations more often in the future." Journalists Rodrigo Soberanes and Javier Estrada and CNN's Doug Gross and Brandon Griggs contributed to this report.